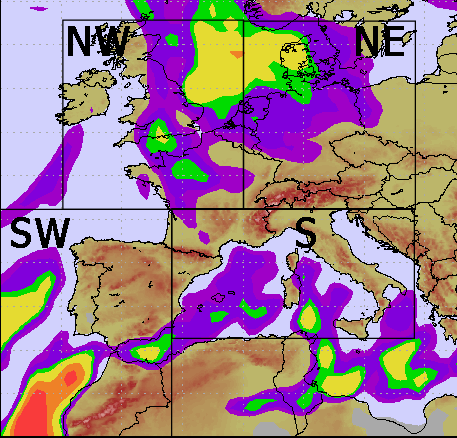 The Tropo-Alert-System (TAS) keeps you informed about upcoming tropo conditions within the defined sectors! Based on the calculated tropo propagation maps using the refractive index forecast by Pascal, F5LEN, an experimental sector based tropo forecast gauge and alert system has been implemented. The system sends auto-generated twitter notifications about expected tropo propagations within the next 48h in the respective sectors. - Tropo propagation is calculated four times per day. - The sectors are indicated on the gauge as "NE", "NW", "SW" and "S". - The gauge steps and colors are similar to those used by the forecast maps (Nil, Weak, Good, Strong, VyStrong, Duct). - Current trigger values are set to "Strong" for all sectors. - Notification is send once for every trigger. Next notification will only be sent after tropo propagation drops below trigger value again. - After request, a limited number of accounts are available to receive notifications directly via email. Just contact us, if you are interested. Please notice that this model is in an early development phase. Trigger values, sectors and calculation are still under development and might be adjusted anytime! 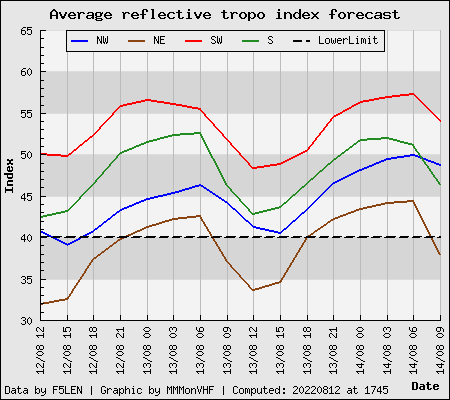 In addition Pascal added a script, which calculates the average reflective tropo index for each sector as defined above. This data is visualized in the graph below.